Are dreams created by Jivatma or Paramatma? 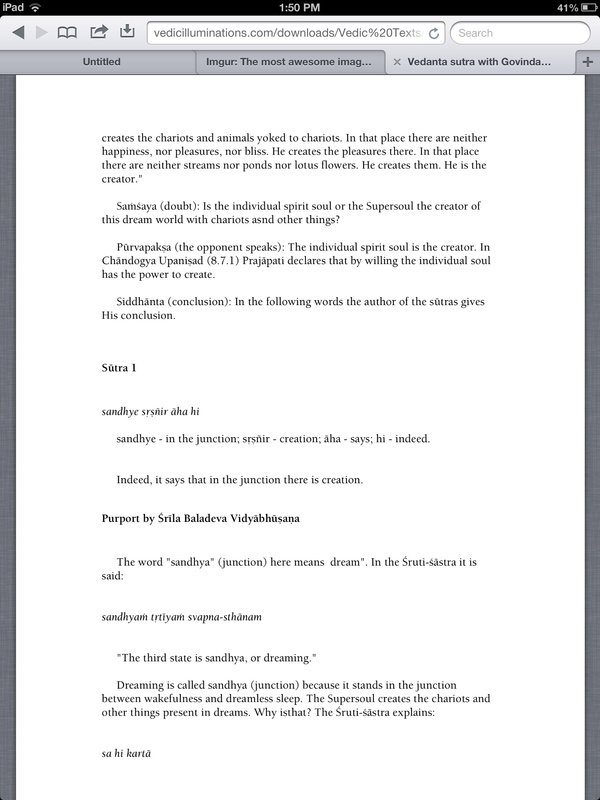 Are dreams created by Jivatma or Paramatma? What is the take of Badarayana as per Brahma Sutras and the three principal commentators on it viz. Ramanuja, Shankara and Madhva? The statement made above that in the Kâthaka the highest Self is spoken of as the shaper of dreams is untrue; for another scriptural passage ascribes that activity to the individual soul, 'He himself destroying, he himself shaping dreams with his own splendour, with his own light' (Bri. Up. IV, 3, 9). And in the Kâthaka Upanishad itself also we infer from the form of the sentence, 'That one who wakes in us while we are asleep,'--which is an anuvâda, i.e. an additional statement about something well known--that he who is there proclaimed as the shaper of lovely things is nobody else than the (well-known) individual soul. The other passage which forms the complementary continuation of the one just quoted ('That indeed is the Bright, that is Brahman') discards the notion of the separate existence of the individual soul and teaches that it is nothing but Brahman, analogously to the passage 'That art thou.' And this interpretation does not conflict with Brahman being the general subject-matter.--Nor do we thereby deny altogether that the highest (prâgña) Self is active in dreams; for as being the Lord of all it may be considered as the guide and ruler of the soul in all its states. We only maintain that the world connected with the intermediate state (i.e. the world of dreams) is not real in the same sense as the world consisting of ether and so on is real. The things appearing in dreams-chariots, lotus tanks, and so on--are absolute Mâyâ, i.e. things created by the Supreme Person. For the term 'Mâyâ' denotes wonderful things, as appears from passages such as 'She was born in the race of Ganaka, appearing like the wonderful power of the divine being in bodily shape' (devamâyâ). The sense of the passage 'there are no chariots,' &c. then is--there are no chariots and horses to be perceived by any other person but the dreaming one; and then 'he creates chariots,' &c.--i. e. the Supreme Person creates things to be perceived by the dreamer and persisting for a certain time only. Those things therefore are of a wonderful nature (but not illusions). And the creation of such wonderful things is possible for the Supreme Person who can immediately realise all his wishes; but not for the individual soul. The latter also, indeed, fundamentally possesses that power; but as in the Samsâra state the true nature of the soul is not fully manifested, it is then incapable of accomplishing such wonderful creations. The text 'the person shaping one desired thing after the other' declares the Supreme Person to be the creator, for the clauses immediately preceding and following that text (viz. 'He who is awake in those who sleep'; and 'that is the Bright, that is Brahman, that alone is called the Immortal; all worlds are contained in it and no one goes beyond'--Ka. Up. II, 5, 8) mention attributes distinctively characteristic of the Supreme Person. And the Bri. Up. text, 'For he is the maker,' must therefore, in agreement with the Katha-text, also be understood as declaring that it is the Supreme Person only that creates the things seen in a dream. The creation (of things) in the intermediate state (of dreaming) (as well as their withdrawal) is the work of the Lord, as scripture says that. Even dreams are not presented in cognition except by Him ( without the agency of the Lord). This appears from the Sruti "In the state of dream (in the sky, in Svarga, or in heaven), there are no chariots, no horses, no paths; but at that time only the same Lord creates chariots, horses, paths, etc." (Bri. VI. iii. 10). And most other commentators on the Brahma Sutras agree with Ramanujacharya, as you can see in this excerpt from the Srikantha Shivacharya's commentary, this excerpt from Baladeva Vidyabhushana's commentary, and this excerpt from Nimbarka's commentary. What do scriptures say about lucid dreaming? What scriptures discuss why the sky appears blue? What does Brahma sutras say about Susupti state? What are objections on Sabda Brahman school thought? How do Sri Vaishnavas interpret the “Vedas are not Vedas” quote in the Brihadaranyaka Upanishad? Why does the Jiva reside in Brahman during deep sleep? Is Dramidacharya the same as Thirumazhisai Alwar? What is Kumarila Bhatta's view of the relation between Jivatma and Paramatma? Where do the Vedas describe dreaming of a black-skinned man? What substances cause prophetic dreams?